Use the form below to inquire about Heritage Hotel near Pichola Lake . Use the form below to reserve for Heritage Hotel near Pichola Lake . Get a taste of the royal life at the Heritage Hotel near Pichola Lake, the perfect place for a pampered, luxury holiday. Time stands still in Udaipur, also known as the city of lakes. The tawny ridges of the Aravalli Hills stretch in every direction. The Pichola Lake shimmers under the sun and does its bit to lend the historical city a romantic ambiance. Age-old havelis, palaces and temples, colorful markets and countless narrow streets offer a striking contrast to Udaipur’s natural charms. Talking about palaces, the Heritage Hotel near Pichola Lake is a tranquil holiday abode that embodies the magnificence and grandeur of the beautiful city. Considered by many as one of the best wedding venues and boutique hotels in India, this heritage hotel is where tradition meets modernity; luxury meets leisure. The Heritage Hotel near Pichola Lake is a modern hotel located close to the city center. Although located on the lake, it is only a stroll away from the heart of the city. The hotel was conceptualized, designed, and created to be one with its surroundings. It carries the same architectural elegance you would expect from a royal palace. Within its traditional décor, the hotel houses ultimate luxury. It is equipped with luxury rooms and amenities of the highest standard to pamper and spoil its guests. The hotel’s architecture is a true reflection of Udaipur’s traditional, old-world charm. Colorful flowers and shrubs decorate the hotel’s spacious lawns. Among the many luxurious facilities available, the three swimming pools speckled on the property are oases of shimmering blue water. 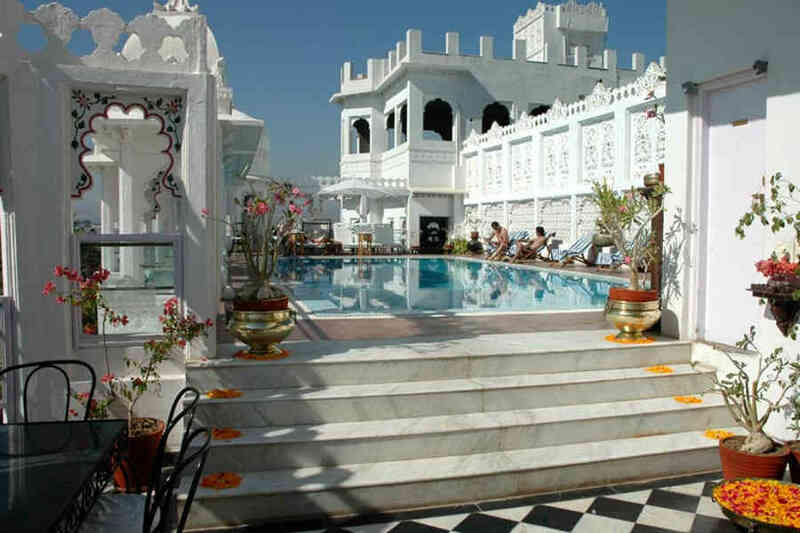 One of them is a rooftop pool, the only one in Udaipur, which has earned a rightful place in Cigars and Leisure’s list of ‘10 Best Pools in the World’. The hotel’s rooftop restaurant has a palm court and dishes out sumptuous delicacies from its comprehensive menu. There are 64 well-appointed rooms and suites at the Heritage Hotel near Pichola Lake, each of which is an epitome of luxury accommodation. The categories include Standard Room, Deluxe Room, Super Deluxe Room, and Udai Suite. All the rooms are equipped with top-notch modern comforts you would need during your stay at the property. The room interiors feature a perfect balance between traditional charm and modern luxury. Each room has its own style and character and is tastefully decorated with luxurious upholstery and furniture. The high standards of accommodation and everything else at the hotel will give you a taste of true luxury during your holiday in Udaipur. When ultimate luxury calls, are you ready to indulge? Private Boat Ride 45 Minutes in Lake Pichola residents & non-resident guests. Small Boat (Minimum 02 and Maximum 05 pax) for the whole boat (charges would be applicable). Big Boat (Minimum 07 and Maximum 25 pax) for the whole boat (charges would be applicable). Cancellation received within 15-30 days prior to arrival will incur the 25% of the total charge. Cancellation received within 7-15 day/s prior to arrival will incur the 50% of the total charge. Cancellation received within 1-7 day/s prior to arrival will incur the 75% of the total charge. Udaipur’s many lakes and palaces lure visitors from all over the world. The City Palace, Bagore Ki Haveli, the Fateh Sagar Lake, and the Monsoon Palace or Sajjangarh Palace are some of the must visit landmarks and places in Udaipur. That’s not all. A trip to this city cannot be deemed complete without a visit to the Saheliyon Ki Bari or the Garden of the Maidens, Jagdish Temple, and the Doodh Talai Musical Garden. The lakes in Udaipur offer great vantage points to catch an orange sunset while the city hums about its day before embracing the starry blanket of the night. Come evening, the reflection of the city lights in the lakes are a sight to cherish. The hotel offers its guests a private boat ride in the Pichola Lake. In order to give you a glimpse into the rich culture of the region, folk music and dance are also organized. The vast gardens of the hotel are ideal for a leisurely stroll any time of the day. The three swimming pools call for a splash to beat the heat. And when it’s time to relax and rejuvenate your mind, body, and soul, head to the hotel’s spa for a soothing massage. The hotel is located 24 km away from Udaipur’s Maharana Pratap Airport. The international airports in Jaipur (400 km) and Delhi (643 km) are also popular among domestic and international travelers. The nearest railway station from the hotel is Udaipur Railway Station (3 km) closely followed by Rana Pratap Nagar Railway Station (6.5 km). These two stations connect the region to many major cities in India including Delhi, Jaipur, Mumbai, and Agra. Udaipur is a road trip away from major cities, such as Vadodara (344 km), Indore (391 km), Agra (635 km), and Delhi (657 km). The highways en route make it a smooth drive to and from Udaipur to various parts of the country.